Shatta–Wizkid–Timaya beef, Ebony and Ahuofe Patri N@kedness, Yvonne Nelson, and Jamie Roberts is all that we are talking about now and has taken over all headlines and news topics as they don’t cease to surprise us. 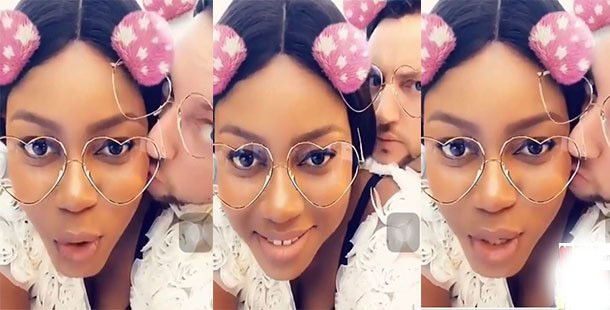 The Ghanaian actress Yvonne Nelson whose story has become rampant on social media because of her new baby and the alleged relationship with British married photographer, Jamie Roberts has once again got us something to talk about. In some minutes video posted online, Yvonne was spotted been kissed on the cheek by her alleged British married photographer boyfriend, Jamie Roberts. The kiss comes as a halfway evidence to confirm the circulating rumors that have been on social media over the two involved in a romantic relationship. Yvonne Nelson on her relationship matters has tried as much as possible to twist and give unclear answers to questions concerning her pregnancy and the identity of her baby’s daddy. However, the actress gave a clue that her boyfriend was a British and a London-based photographer who she had met in her travels outside the country. Also, many people got a hint there about the relationship when Jamie posted some exclusive pictures of Yvonne Nelson on his Instagram account to wish her a happy birthday. Well, knowing the identity of the alleged Yvonne’s baby daddy, Jamie did not come with a golden star but rather came with a headline that the celebrity photographer was married to a Nigerian lady identified as Keela Harrison and the couple was on a divorce track.